1:48 fans have waited for what seems like forever on these new kits from new company Hobby Boss and the first kits should be available around August. 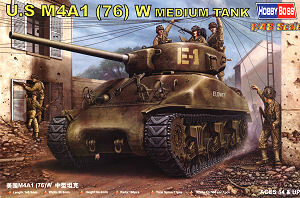 To get things going is the first of five Shermans listed for release with this kit being of the M4A1(76)W and as a long time Shermaholic it’s good to see someone starting off a new series with an Allied vehicle with the T-34s to follow. Without wanting to pre-empt the findings of this review the one word that comes to mind on this release is “frustration”. There must be more preserved Shermans of all types around than any other WWII (and beyond) vehicle yet still manufacturers can’t get things right in many areas but this is mixed with some fine and well done detail. The kit consist of 232 parts in light grey plastic, a small etched fret with 14 parts and a set of vinyl tracks plus the decal and instruction sheets. Overall the detail level is quite good with well defined detail relief and some very delicate parts such as the barrel travel lock, lifting eyes, the tools and bogie detail but unfortunately the fit of some parts compromises the detail while there is a fair bit of flash evident of many parts plus a few pin marks to be dealt with. An example of this is the hatches that have very fine casting numbers on the inside but a large pin ejector mark right amongst the raised numbers which means most of the detail will be gone after filling the ejector marks. Dimensionally the kit measures out very well against the 1:48 plans in Hunnicutt’s Sherman bible for items like the hull length, turret height and diameter and the bogies and most of the smaller components but unfortunately a few major areas such as the hull side angles, mantlet profile and the tracks are a problem as well as some of the detail within the parts that are dimensionally okay as well as some fit problems. The transmission cover is the later single piece sharp nosed type and the contours look good but have some flash to be trimmed from the top and some minor gaps to be filled at the sides after fitting with the final drive housings covering some of these. The upper bolted flange has two locating lugs included but you should cut these off as they don’t do anything and there are some fit issues with the hull but more on this later. The fit of the rear hull panel will need the inner locating lugs reduced in thickness by about half to fit between the hull sides while the sponson fillers have small notches to ensue you glue them in the right place but there are some gaps between these and upper hull after they are joined together later. Added to the rear plate are the hull side and rear idler mountings plus a couple of two part round air cleaners and the central towing pintle and two lower tow shackles with the two engine doors moulded closed. There is also the large radiator grill that fits under the hull overhang which has quite nice grillwork included. This is one large moulding much the same as the real cast hull with separate engine deck, front crew hatches and most of the smaller fittings but there is no cast texture included which would be minor in this scale anyways. Images showing the incorrect hull angles. The contours of the glacis visor housings are also a little too harsh and should be more subtle but a little work with the wet and dry should remedy this. The separate engine deck has nice details included with separate part for the forward intake and upper cover although the contours of this are a little “square” and can do with be rounded off a little. The fit of the engine deck to the hull required a little trimming of the panel sides and test fitting will determine what is needed. Still at the back there are separate grouser covers but these have a distinct square profile and should be more rounded and a little sanding work would be in order while the “mesh” on the front is best not spoken of and we will probably be offered as replacement mesh in the inevitable etched sets. Moving to the front the two separate crew hatches have basic periscope details on both sides with etched periscope guards as well as fine casting numbers on the inside as mentioned above but these are compromised by the large pin mark on each hatch. The fit of the hatches to the hull is not the best and some trimming will be needed for a better fit if you want to show these closed. The head lights and siren are again nicely moulded for the scale and have etched guards to again give a good appearance and the two lifting eyes look good and the two right side ventilator covers are also separate parts. Fitting the upper and lower hulls together proved quite troublesome as there is a large gap (about 1mm) at the front between the upper hull and the transmission housing bolted flange and one solution is to trim the back of the sponson fillers so the hull sits a little further forward to meet up with the transmission housing better. This will mean the rear hull overhang is about 1mm too short but will not be as noticeable as the gap at the front. I also added a lip of plastic card behind the bolted flange to support the upper hull to hold it at the right height better. 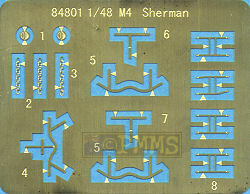 The tracks are continuous vinyl T48 rubber chevron track the same type as with the Tamiya Sherman kits but there is a problem in that the end connectors and guide teeth are not located centrally between each track link. Instead they are positioned at the edge of each link with one pin of the end connectors level with the division between each link and rectifying this on the soft vinyl is nigh on impossible so it either live with the issue or find alternate tracks. The instructions claim the tracks will glue together with normal plastic cement but not the cement I have and you best resort to using the small heated screwdriver head to melt the join pins together as with most vinyl tracks. There is the optional later .50cal MG rack mounted on the ventilator cover at the rear of the turret and if this ventilator cover is required and you have to cut out the locating hole in the turret before gluing the two halves together. A .50cal and .30cal machine gun are included but these are a little chunky especially the perforated cooling jackets but these are difficult to depict convincingly in this smaller scale. There are markings for one US WWII vehicle in two tone olive drab and dark earth but no information is given on the unit and the second has post war Israeli markings in overall olive drab. 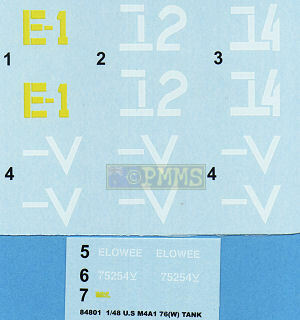 A colour sheet is included with illustrations of the two marking options showing the decal placement. Well we get quite a mixed bag here with some very nice petite detailing but a bit of flash and other cleanup needed with the overall dimensions of the kit being good but it’s downhill from there unfortunately. 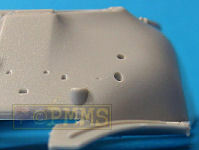 There are numerous detail issues from the hull and mantlet contours, the track end connectors, to the road wheels details and others in between and the fit of parts leaves a bit to be desired. But the bogie units are very well done as are other parts and some may not be bothered with the smaller detail issues and be happy with the kit. The overall impression is one of so close yet so far and obviously the suspension parts will be those included in the other Sherman kits announced but let’s hope some of the detail issues are addressed before then? 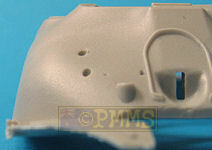 Recommended only because its a M4A1(76)W in 1:48.